When files are scattered across your device on both internal and external storages, it’s easy to lose important things. Not only is it hard to find certain items, but if different applications create different folders for both videos and photos, it’s easy to have your gallery or file manager applications get out of hand. 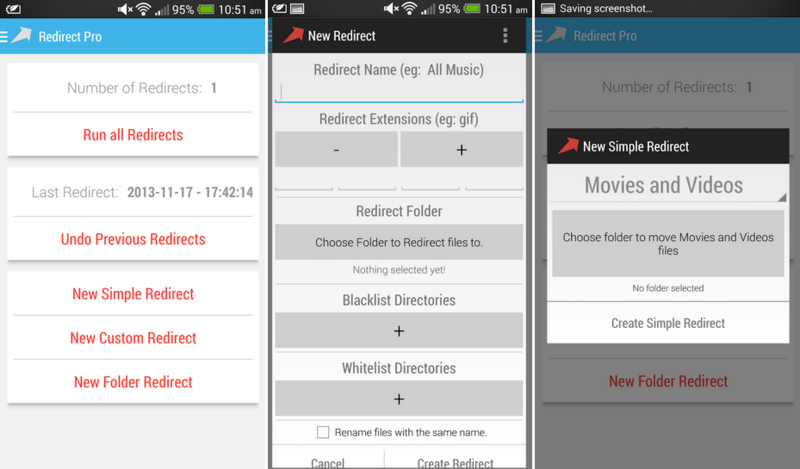 This is where Redirect File Organizer comes into play, allowing Android users a simple way to organize and declutter their folders. The way it works is very straightforward; just create a redirect, for example you can make one titled “movies and videos,” and then all file types associated with movies and videos are placed in a folder together. Going forward, any new file type that falls under that category is placed in that folder for easy organization. If you think your phone or tablet can use a good cleaning, go check it out on Google Play. Contest: Win an AT&T LG G2 from Droid Life!